Gardens are not the only venues to exhibit plants as a work of art. While many houseplants exist and conservatories with indoor botanical exhibits are growing in popularity, the true artistic potential of plants as a living medium for creative works is rarely expounded upon. The traditional display of plants can become tiring and uninspiring, as a single specimen of a series of plants is grouped together in an array of contrasting or complementary colors to elicit a desired aesthetic. Rather than display plants in potted soil or the natural setting of growing up from the earth, we should push for a radical change in display, pushing flora to its limits and expanding its potential as an artistic medium in a way not found in the natural world. Azuma Makoto cultivates the fullness of this idea. Owner of JARDINS des FLEURS, a haute couture flower shop in Tokyo, Makoto specializes in both the artistic practice and client work of using trees, leaves, flowers, and moss to construct various pieces of art. While his customers receive state-of-the-art, highly customized floral arrangements to fit any form of their imagination, the embodiment of what Makoto can envision for his plants exists within his private work. 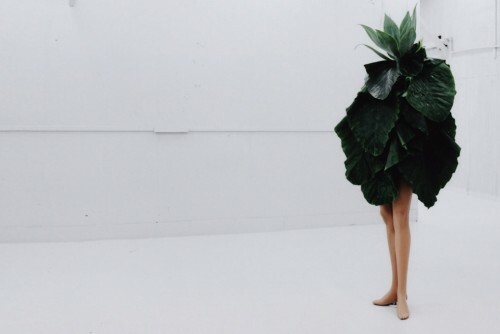 Dozens of his displays have appeared around the world, each with a unique intent, from suspended trees to floral body suits. It can be considered among the most beautiful and unique practices in the world. One of the most fascinating displays has been in suspending plants. Using the metal frame of a cube and a series of thin wires, Makoto strings up a variety of plants, giving them the effect of floating. Considering we rarely see a full plant—that is, we mainly notice the leaves and flowers and features of the plant above the soil—suspending the plant in open space allows us to visually explore the roots and finer points of the specimen from several perspectives, unbound by the earth. Like the ancient Japanese art of bonsai, Makoto incorporates small trees into his display, bending them in unnatural directions or exposing them to frozen environments for the sake of aesthetics and exploration. In exploring the potential of the plant medium, it is interesting to dissect the human relationship with flora. While we are, in fact, fauna—animals—looking into the connection we have with our counterparts can incite many ideas. Makoto, in his “Leaf Man” exhibit, displays a metaphorical symbiotic relationship we can hold with our little green friends. Through employing plants, specifically leaves, as means of covering our bodies, we see that plants offer us shelter and cover. While we exhale carbon dioxide and they inhale it, they in turn fill our lungs with oxygen and offer the boughs we need to build homes. They conceal us, and we support them. Also, this display strangely mirrors the Garden of Eden and the Biblical need to conceal one’s body. Makoto’s art does not end with the use of suspension and human coverage. In his “Collapsible Leaves” exhibit, Makoto limits his medium to only leaves, folding them in intricate patterns and combining them in ways to create a naturally-appearing product. He goes so far as to invert his plane of growth and direction by having bonsai trees grow out of a lush surface on a wall. Turning dimensions askew, Makoto challenges our perceptions of what plants can be and where they can be found. Altering the state of plants is an idea Makoto has whole-heartedly embraced. Via his work, he has pushed the potential of plants and unlocked greater avenues for future floral art. --I'll say more later! Loved Makoto's art!